OOTD - Burgundy Cape Dress | La Petite Noob | A Toronto-Based Fashion and Lifestyle Blog. As a former Valentine's Day nay-sayer, it actually makes me laugh to think about how much I've embraced the holiday! Maybe it's because this Hallmark holiday comes along with flowers, hearts and a pink colour palette but I think it's definitely due to the fact that it's a day where we just celebrate love. I'm definitely getting softer as I get older! In line with the season, I chose this gorgeous cape dress from online boutique LANGsura. It's called The Monarch, and I totally see why - I feel a bit like a butterfly in it! Toss on some knee-high boots (it is still winter, after all) and a bold lip and I'm ready to hit the town for Valentines Day! What do you think? Are you a Valentine's Day lover or would you rather do without it? What about a Valentine's Day convert like me? Let me know! This dress looks amazing on you! SUCH a stunner! And I love any excuse to throw on some pink and red. This dress is so beautiful! I love the color and the fit is amazing! Thank you so much Lee - I love the dress too! Well, when you look so pretty in Valentine's Day attire how can I hate the holiday? Seriously?? You look amazing! Love the colour. Thanks Eleni! I used to be such a Valentine's Day grouch, but now I appreciate any holiday where I don't have to make dinner LOL! 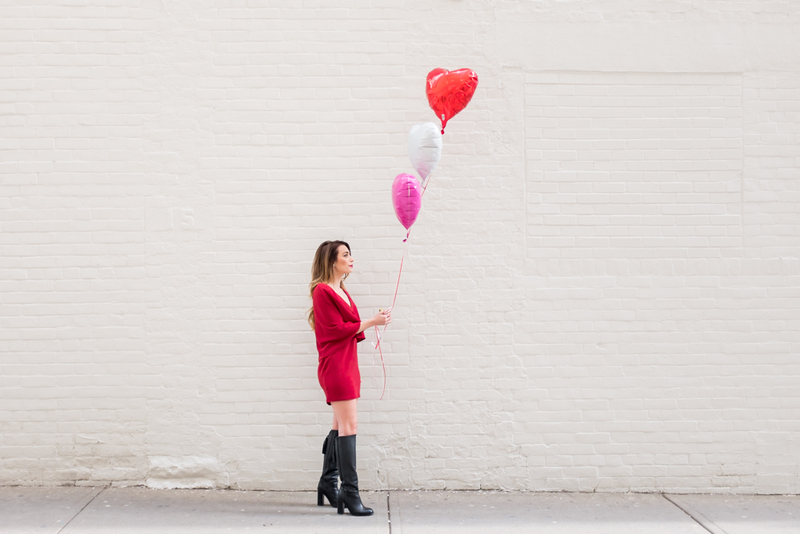 Just wait Kris - I never thought that I would be into Valentine's Day, but the thought of not having to make dinner for a night is enough to turn me into a Love Day cheerleader! I am in no way a girl who likes Valentine's Day (seriously, I've either been single or disappointed by it)...but I do love pink and all of the girly goodies that come with the holiday. That dress is gorgeous! I'm not too crazy about Valentines Day but this dress is stunning on you! Thank you so much Miche! LOL that sounds exactly like our plans for the day, Brittany! Burritos, Game of Thrones and taking pictures of our Chihuahua!